Not long after the trees came crashing down in our neighborhood, and roof shingles peeled away and went swirling through the air, and property, but not people — thank goodness not people — was crushed under tons of fresh, wet wood, city and utility workers descended on the scene to wrangle the mayhem back into order as neighbors all around poured out of their houses. Two of these neighbors ordered pizzas, and after they were delivered, they thrust slices toward anyone who passed by. A tired city forester at first declined the offering, but with a little prodding, he gave a sigh of happiness, shook his head ruefully, chuckled, and gobbled down the slice. Everyone on the block looked at each other with wide eyes filled with wonder and relief and dismay. Our street became a major thoroughfare, the only open connector between two arteries. The city bus rumbled past, diverted from its route, a first for us in over a decade of living here. A stream of traffic to rival that in any big city crawled along. As drivers crept by our house, inevitably speaking on their cell phones — “I’m gonna be late;” “Every road is closed;” “You gotta see what’s happened in this neighborhood!” — their eyes grew wide upon seeing the 40-foot tree stretched across our driveway and front yard, topmost branches poking at the door and windows of the house. Then, the drivers spoke rapidly into their phones, gesticulating while they reported to someone near or far what they had just witnessed. The tree’s roots, massive and torn and jutting crazily from clods of wet earth, faced the street. Some people sat or stood on the trunk or clambered onto the tangle of roots, posing for pictures. Though I understood their revels, I also hated them a little bit as I surveyed the damage and wondered where to start. Mostly, though, I thought about how lucky we were that the tree had fallen at exactly the right angle to miss most of the house. It had peeled away the side of a gutter as easily as you’d bend a beer can, and it had knocked a planter askew under the front windows, but it hadn’t crushed the place, though it could have. After the tree was removed. I had trouble taking my eyes off of one thing. Our basketball hoop lay mangled under the tree. Metal parts had been sheared by the force. Its base was torn and partially flattened, the backboard cracked, the rim bent. And it was that, more than anything else, that reminded me how close we had come to tragedy. Our kids play basketball out front a lot, so much so that our daughter’s response to the demise of the hoop was, “Oh nooooo! That’s our best toy!” If they had been playing when the wind came, they would have been killed. When the storm hit, I was at work, arguing in court in another county, but neighbors described it as sudden, flying in from the southwest without warning. One described her friend urging, “Let’s get inside” only seconds before the wall of 75 mile-per-hour wind barreled in and a tree crashed down where they had been. She said that had it not been for her friend seemingly sensing a shift in the air and acting fast, she may well have been killed. Usually her son would have been with her outside. She wondered aloud whether he would have heard and obeyed the warning quickly enough as the storm roared in. And so I looked at that basketball hoop over and over again, even as I worked with friends to cut away small branches so I could get into the house, even as dear neighbors invited us down the street for dinner in a lovely, burden-lifting gesture, and even as gawkers did as gawkers do. “What if?” went through my mind. “What if? What if?” Would our kids have had time to get away if they had been playing basketball in the driveway? They have played there in nearly all weathers. Before the wall of wind came, the weather wasn’t that bad, people said. Would it have kept the children inside, where they would have been safe? Or was it all too calm beforehand, and all too sudden when the storm broke? The city foresters, masters of chainsaws and winches, took our fallen tree away before dark, dragging it into the maw of a massive chipper that reduced it to mulch in a roaring, grinding minute. 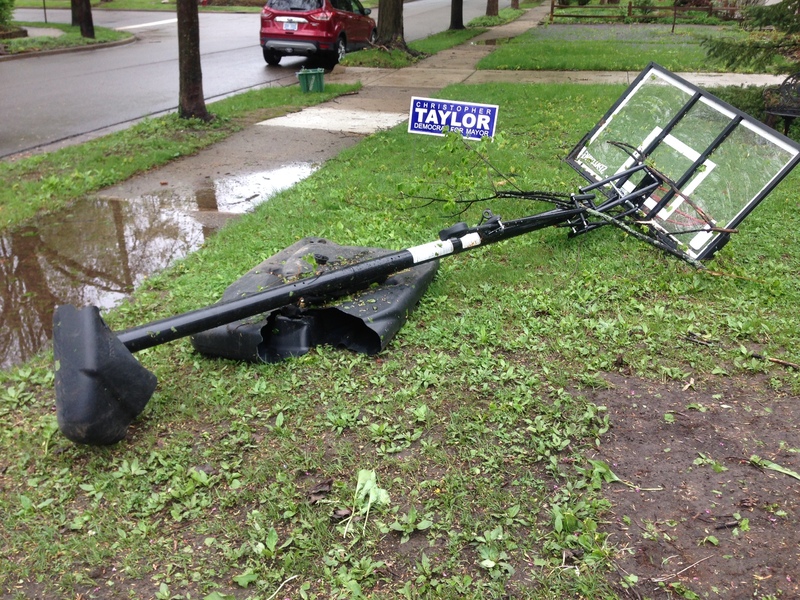 The basketball hoop lay forlorn and demolished in the front yard, giving the place a junky look. That evening, as the light faded and the sky mellowed toward indigo splendor, I took a walk around the neighborhood. Some fallen trees remained; where they had been removed, the earth that had once held them was riven and disrupted into lumpy mounds of damp soil. The small garage of the house behind us lay under a tree, the building twisted and shoved off its slab and looking like it could collapse with a light touch or breath of wind. 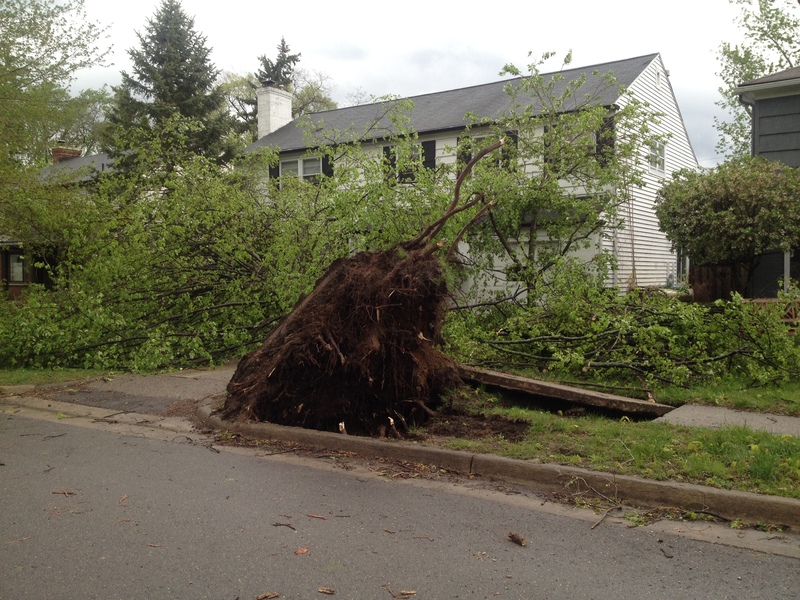 Around the corner, a massive tree limb lay on a neighbor’s front lawn. It had missed the house and even the cars parked below. Some of the bark was peeled away. Underneath was yellow-tan, raw wood. Its surface appeared silky smooth and shone in the dying light, nature’s perfection revealed. After staring at it for a while, I could not help but caress it, marveling that it felt as smooth as it looked.